Great to have found HybridZ Forums. Have been reading lots of useful zinformation for 2-3 hours and decided to register. This red ‘77 280Z is my 4th Z recently purchased in November 2018. In my late 20s to early 30s I owned a ‘73 240Z, ‘75 280Z and ‘74 260Z in that order. Of course they were fairly new back in the day. That’s me in 1979 with my silver ‘75 280Z. Wish I could have kept it. LOL Yes, I absolutely love these beautiful S30 Datsuns. 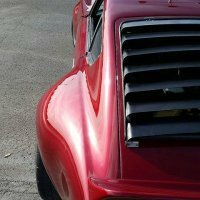 Look forward to the forums here being a great resource for maintaining our 40+ year old cars. It’s a passion and love affair! Hey everyone, this build will document my tear down and rebuild of a 1977 280z. This is my first restoration project and as such, I plan to take this slowly and methodically so I can remember how to build it back up! My goals for this build: Complete teardown, soda/abrasive blast entire body Fix any rust and dents Paint - Not sure what color yet, but factory color is blue. I like the blue color and might think about a white racing stripe, but again, I am not 100% on the color scheme yet. Install a 5.3 LS (LM7) engine and t56 6-speed (eventual power goal is 350-400 hp) Install a R200 LSD (final gear ratio TBD). The car has a R180 open diff most likely, I will confirm as I get to removing the suspension. 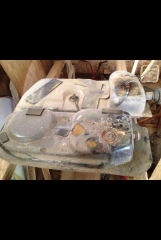 Refinish the interior - Most the plastic is in terrible condition, everything is very brittle and the center console and dash are cracked pretty badly. My goal is a light tan leather interior with some modern updates (power windows, locks, seat heaters, new head unit, racing wheel). The interior is white/tan currently and I like the white with blue combo so that is in the running. I feel I am about 1-2 years, at least, away from having to decide on this. Complete everything myself so I can learn about each and every aspect of this process. I might consider farming out engine rebuild because I really don't want to mess that up, but my initial plan would be just to use stock internals on the engine, and rebuild the engine after the car is up and running for a while. Have Fun! Don't get too frustrated or more importantly take a break when stuck. My next post is going to detail the current state of the car. I welcome all input, advice, and suggestions! Hi all, I just joined the forums. I bought a 77 280z a couple of days ago and I'm having trouble passing emissions. The previous owner installed a megasquirt EFI which wasn't really the issue during the test. However, some vacuum lines are missing. The EGR valve isn't connected to anything and the vacuum line diagram shows that I must have a BPT valve, which I don't. Would it be ok if I connect the EGR valve directly to the intake manifold? The other issue is the purge valve on the carbon canister isn't connected to anything either, form what I understand, it should be going into the throttle chamber where you can see that it's plugged in Thanks! Title pretty much says it all. I like the OEM vents but will consider aftermarket ones. Located in Everett, WA. Just PM me here. Thanks! Hello, I am in need of a few factory nissan/datsun parts for my 1977 280z. I am doing a factory restoration and would like to keep it all original parts if possible. Factory air intake tube everything before throttle body except AFM. This includes stock blue airbox/hoses Braket for fuseable links Braket for Carbon Canister and a Carbon Canister Braket for AFM 4 bolt on the bottom of AFM Almost all Brakets that are on the passanger side of the engine bay Stock Radiator -This is off an automatic car with A/C If you are doing a part out of a 280z and have alot of miscellaneous engine bay hardware that you cant get rid of let me know. zspeed22@gmail.com or PM me on here. rebuild kit for 77 280z, pistons? I'm attempting to track down the current or previous owner of a 1977 280Z which is mentioned in this blog post: http://carticular.blogspot.com/2012/09/ebay-find-77-280z-ls1-swap.html The car was once for sale in Gretna, LA and listed on eBay in September 2012. Any help appreciated! So I'm now in the bodywork phase of my project trying to smooth out the dents and dings, I'm going with a flat green after I primer it. I'm kinda doing everything backwards mechanically. I've decided to refinish all the suspension and underbody hardware after I get some paint on her. Its been a hell of a road with this car, house buying put me way behind on this whole deal. I love this car! Oh and the pic, I got a notion to just up and do it last night at like 1am. I brought out the flash gun and my camera. Anyway back to the bondo party outside.